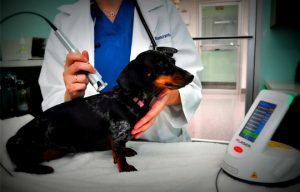 We are delighted to announce that we have acquired a new class 4 laser therapy unit which is groundbreaking in terms of treatment for canine and feline arthritis. The laser is a painless treatment which does not require sedation and can be done during consultation time. Courses for arthritis typically consist of 6 treatments over a 2 week period and we are having tremendous results with our patients where we are seeing long lasting reduction in pain and improvement in mobility.